When was the astronomical clock created? What is its history? 1338 King John of Bohemia, Count of Luxemburg, allows the burghers of Prague's Old Town to establish an independent municipal seat. 1364 The Gothic house belonging to Wolflin of Kamen forms the first part of the "Rathaus" or Town Hall. A tower – an important symbol of security and power, easily visible from afar in the middle of the square – is added to the house in 1364. As a court was located in each Town Hall, the Town Hall also housed a goal for prisoners and a chapel for Town Council members so they would be able to administer justice fairly and responsibly. 1410 Imperial clockmaker Mikuláš of Kadaň creates a unique clockwork which was remarkable for the fact that in the multi-cultural city that Prague inarguably was, one could use different ways to tell the time. 1458 George of Poděbrady chosen King of Bohemia at the Town Hall. 1459 Historical records kept by Bohuslav Hasištejnský z Lobkovic offer proof that the astrolabe on the Prague Astronomical Clock was existing and functioning. 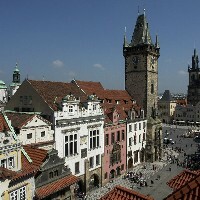 1490 Improvements are made to the astronomical clock and a calendar plate created by Master Hanuš is added. At midnight, the calendar plate always shifts to the next day. The figure of Death ("the Rattler") is also added to the astronomical clock. 1530 Jakub Čech, perhaps the son of Master Hanuš (Jan Růže), is the caretaker of the astronomical clock until 1530. 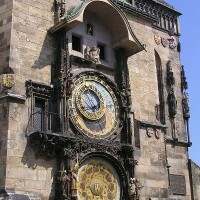 1552 Jan Táborský of Klokotská Hora is placed in charge of the astronomical clock. 1566 The astronomical clock is fully mechanized, including the rotation of the calendar plate. 1587 The Prague Old Town aldermen have bound book copies of Jana Táborský's Report on the Prague Astronomical Clock made for future clock caretakers and administrators. The caretakers were able to add their notes to the book. These notes later became a very important source of information. 1621 The leaders of the Bohemian Revolt against the Hapsburgs were incarcerated at the Town Hall goal and executed on June 21, 1621. 1629 Repair of the astronomical clock recorded, but no details are given. 1659 The astronomical clock is repaired. The exterior moving wooden figures were probably installed during the repair. The rotating lunar sphere system on the astrolabe was also created during this repair. 1784 After Joseph II has the Prague towns merge into a single unit in 1784, the Town Hall becomes the seat of the Imperial City of Prague administration. 1787 During extensive repairs on the Town Hall building, a proposal is made to have the astronomical clock removed and the clockwork brought to the scrap heap. The astronomical clock was not destroyed. 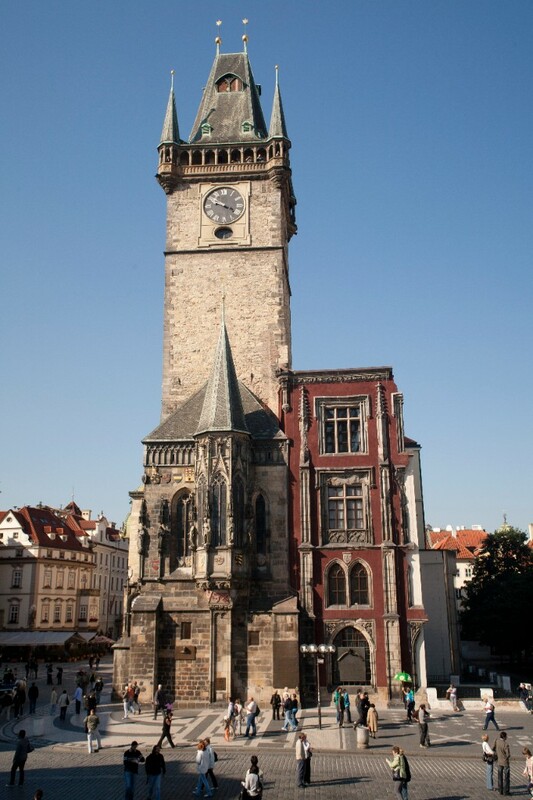 1791 The clock is repaired according to a plan made by Professor Antonín Strnad and the Astronomical Clock was saved. The work was carried out by clockmaker Jan Landesperger. 1848 Prague clockmaker Ludvík Hainz starts working on maintaining the Astronomical Clock. 1857 While in Prague, watchmaker Jan Prokeš studies the Astronomical Clock mechanism and creates a small, functioning model. At the same time he makes an offer to the Town Council that he would repair the entire Astronomical Clock. 1864 A public fundraising effort to repair the astronomical clock is announced. 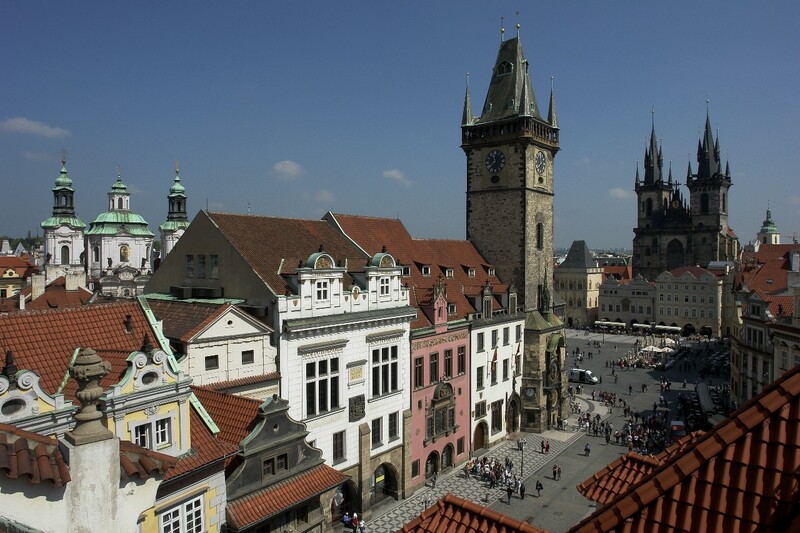 At the same time, a Prague city commission for restoring the astronomical clock is initiated. 1865 Josef Mánes starts work on the new calendar plate. 1866 The repaired astronomical clock is put into operation on January 1, 1866. As much as possible was salvaged from the original clockwork, but a large modern chronometer is added which drives the mechanism running the clock. A chronometer is installed to transmit impulses to the main clock mechanism. An unveiling ceremony for the Calendarium plate is held on August 18. The plate is painted by artist Josef Mánes. 1880 Mánes' Calendarium plate is replaced by a copy painted by Emanuel Krescenc Liška. 1882 Figure of a crowing rooster is added by the company Hainz. It is first played on December 31, 1882. Together with the mechanical rooster, whistles and bellows are created to imitate the rooster's crow. 1945 In the final days of World War II, the Old Town Hall is destroyed by the Nazis in May of 1945. An incendiary shell seriously damages the astronomical clock as well. The figures of the apostles as well as the greater part of the exterior decoration are burned. The astronomical clock mechanism is in a wretched state. 1948 The astronomical clock starts operating again and features new figures of the apostles made by Vojtěch Sucharda. In addition, the bell and drum mechanism are set to Central European Time. 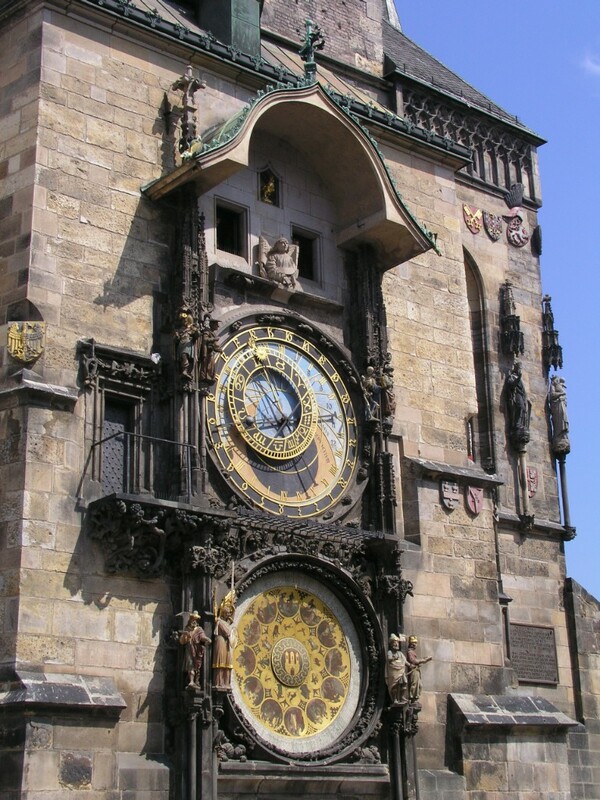 1957 The astronomical clock is repaired and the 24-hour ring showing Old Czech Time is put into operation. 1962 JUDr. Stanislav Macháček points out new proof that leads to changing the date the Prague Astronomical Clock was created. 1976 All original statues and sculptures still decorating the astronomical clock are replaced with copies. The originals are located in the Prague City Museum. 1979 During the repair of the astronomical clock, the bottom plate of the astrolabe is adjusted and all of its parts are restored in the correct colours and sizes, including the twilight circle. 1993 PhDr. Zdeněk Horský submits clear proof and arguments which justify designating 1410 as the year the Old Town Astronomical Clock was created. 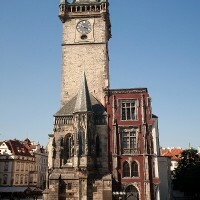 1994 The astronomical clock is repaired and restored under the direction of Otakar Zámečník. 2005 Astronomical clock is repaired and restoration work carried out. At the same time, the exterior figures on the astronomical clock are restored by painter Jiří Matějíček.